In the 1970's Finnish comic book "Nonstop" started to publish Corto Maltese. Me and my friend even wrote a letter to editing office asking them to stop this and publish more Lucky Luke, but Heikki Kaukoranta and Soile Kaukoranta didn't listen to us. In the 1980's Corto started to bother me in my daydreams. I read one of his adventures, then I read them all, even the ones I didn't read before. I didn't read Lucky Luke anymore. Corto built me a bridge from childhood to younghood. 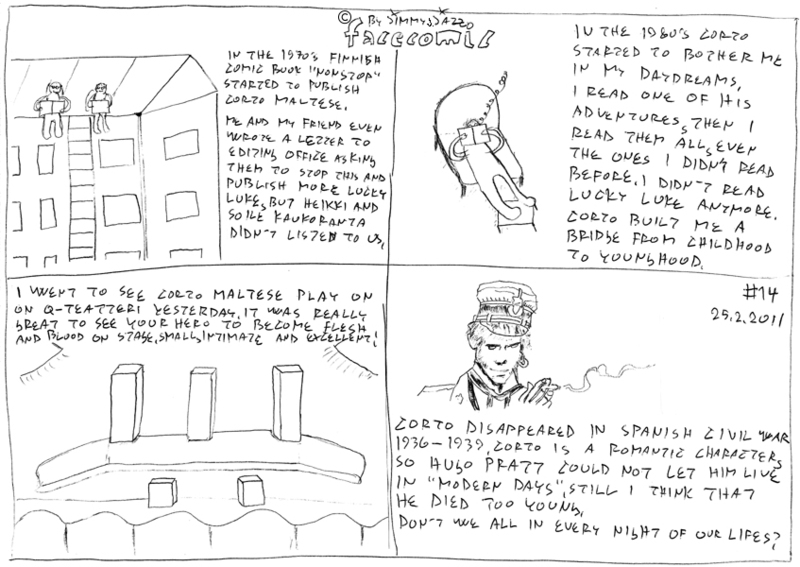 I went to see Corto Maltese play on Q-Teatteri yesterday. It was really great to see your hero to become flesh and blood on stage. Small, intimate and excellent! Corto disappeared in Spanish civil was 1936-1939. Corto is a romantic character, so Hugo Pratt could not let him live in "modern days". Still I think that he died too young. Don't we all do that in every night of our lifes?